“Q3 LOBBYING EXPENDITURES DOWN,” “Lobbing Spending to Rebound in 2014,” “K St. Outlays Dip in December,” – such headlines splash across the pages of Washington-based newspapers. It has become so routine to discuss the business of lobbying exclusively in these terms that one feels the itch to challenge convention and to pose the following question: can expenditures stand alone as a reliable measure of advocacy’s vitality? The answer is obviously no, which most people with a critical eye on Washington lobbying recognize . The shrewd reporter will temper his headline with subtler analysis, explaining, for instance, how the de-registration phenomenon (so frequently discussed in this blog) distorts the data, and supplying opinions of industry leaders apt to tell a story that contradicts the numbers. Yet the appeal to quarterly spending has become so common, has sunk so deeply into the collective consciousness, that it may be corroding our understanding of how lobbying really functions. Firstly, much as money matters on K St., success is often rooted in the intangibles. Making new contacts, for example, and cultivating existing ones. These things often precede spending both in time and in importance, and they’re difficult, if impossible, to measure. Secondly, even if spending were as important as it’s typically portrayed, it doesn’t follow that it’s best divided into neat three-month and one-year increments, as it is now by virtue of disclosure requirements. Some issues take years to appear on the legislative calendar–it’d be ludicrous to claim that everything is on the same timetable. In fact, the only thing that’s more ludicrous is to assume this is the case, which is precisely the current problem. Finally, a lobbyists’ success in Washington is strictly bounded by the political environment in which he works. To get something through committee may be a small victory one year and a large one the next. By definition, a “do-nothing Congress” is the sort of setup that renders doing anything a grand success. So, to impose an overworked phrase on the reader, “it’s all relative”–especially in Washington. Much of this is common knowledge within the beltway. Yet even reminding oneself of what one already knows can be a useful defense against lazy thinking, especially that which tends to overemphasizes the importance of something. And if anything at all tends to be overemphasized by the coterie of reporters covering Washington lobbying (great as they are), it’s the importance of lobbying expenditures. They just don’t matter that much. Posted in Lobbying News | Comments Off on Do Expenditures Matter? EVERY YEAR THE Government Accountability Office (GAO) reports that most lobbyists are doing what they’re legally bound to do: register and disclose. Despite some shortcomings – such as failing to round expenses to the nearest $10,000 and neglecting to report formerly held covered positions – lobbyists are a law abiding and diligent bunch. (Registered lobbyists, of course. Many lobbyists are in fact operating beyond the current legal framework). But this rosy picture does little to deter those tempted to quit compliance all together. Some are asking: why comply? Nobody is getting more than a slap on the wrist for their negligence, so why bother? Posted in Lobbying News | Comments Off on Why Comply? Lions and Tigers and K St., Oh My! The International Fund for Animal Welfare (IFAW) and other groups are throwing their weight behind the Big Cats and Public Safety Protection Act, which would ban keeping the animals as pets or breeding them for sale. Public disclosure records reveal that the IFAW hasn’t been throwing much weight behind anything since the mid-90’s, when in 1996 alone it raised half a million dollars and spent, if you’ll pardon the pun, the lion’s share. The Big Cats and Public Safety Protection Act may reverse that trend, bringing IFAW back to the vanguard of animal rights lobbying. But despite the involvement of animal rights groups, advocates are emphasizing public safety as the measure’s central cause. * The implication is that this approach will enhance the visibility (and ultimately the palatability) of the proposed legislation. The name of the bill is itself a testament to this, in which the bulk of its syllabic frame is occupied by the public safety bit, with “Big Cats” being dispensed with up front and early. Also, there’s no allusion to animal welfare in this designation. How else is the message being pushed? Metro ads. To LobbyBlog’s readers on K St.: look for images of caged lions and tigers the next time you board at Farragut. Posted in Lobbying News | Comments Off on Lions and Tigers and K St., Oh My! “K STREET’S SPRING AWAKENING” is how The Washington Post described the recent blossom of new lobbyist registrations. A formidable batch of 686 registrations were filed in April, just enough to win the three-year record, and more than enough to augur well for those who predict a sprightly Q2. The Post sketches the chronology of lobbying activity as follows: a client hires a firm…a few weeks ensue…said firm registers after their first contact on the Hill…a few weeks ensue…said firm reports fees. Given that typical Q4 hiring seeped into the first months of 2013 (because of the fiscal cliff, as some have claimed), then a full rebound may come later than previous years, reaching its apogee this summer. There’s just one problem: August recess. All together, too many factors are clouding the usually clear-eyed and credible metric of reported lobbying spending. A decrease in year-to-year spending from 2012-2013 may well result, continuing a trend that began in 2010 and prompting a slew of reporters to herald the demise of traditional lobbying. These tidings, should they come, are best taken with a skeptical eye. Posted in Lobbying News | Comments Off on Star Power in D.C.
OPENSECRETS BLOG recently sketched an unlikely comparison between the political influence of big tobacco and that of education. While the former’s command in Washington has largely waned since the 90’s, the opposite can be said of the education “industry.” Both have gradually become more partisan, tobacco leaning increasingly to the right, and education to the left. In most election cycles between 1992 and 2002, the majority of the industry’s contributions came in the form of soft money. 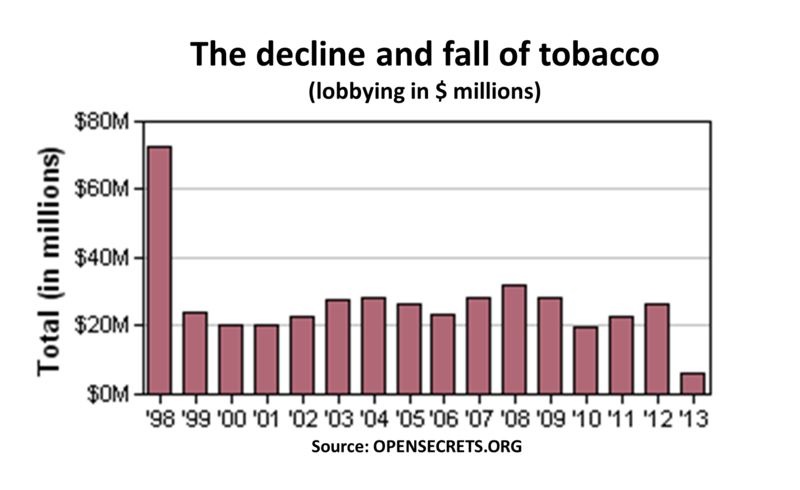 When the Bipartisan Campaign Reform Act of 2002 banned those contributions beginning with the 2004 cycle, tobacco dropped from 41st to 66th among industries in terms of overall donations, and to this day has not recovered. Mark Zuckerberg hired a couple of lobbyists for his new advocacy group. “Zuckerberg is teaming with other Silicon Valley execs like Joe Green to start the group, which is expected to broadly focus on economic issues like immigration and education reform.” The lobbyists were picked up from Fierce, Isakowitz & Blalock and Peck, Madigan, Jones & Stewart. The regulations, which require D.C. Council approval to become law, offer a two-tiered system in which food trucks would still be allowed to sell from any legal parking space , as long as they follow the posted time limits. But truck operators would also be able to apply for a permit for a specially designated spot that would allow them to vend from 11 a.m. to 3 p.m.
As a refresher: The proposed regulations call for 23 mobile vending zones throughout the city where limited numbers of food trucks would be allowed to sell food. Each zone would have a minimum of three parking spots; the cap is still unknown. A monthly lottery system would determine who got the spots for each weekday, and those who don’t win zoned locations would have to park at least 500 feet away from the zones. In the central business district, mobile vendors would also be limited to metered parking spots with less than 10 feet of unobstructed sidewalk. Since the D.C. Council cannot amend the proposed rules, those who fear for their business have no option but to lobby for a ‘No’ vote. A map of would-be affected zones can be found here. POLITICO on Why K St. = (R) St.
Posted in Lobbying News | Comments Off on POLITICO on Why K St. = (R) St.
House of Cards: Fact or Fiction? …lying, leaking secrets to lobbyists, framing rivals, indulging in fistfights (one in front of wide-eyed children) and snorting cocaine, as well as sleeping with prostitutes, their own staff and a story-hungry reporter. While the Cassidy building’s existence is undisputed, it’s dubious whether any lawmakers are snorting coke. So what’s the veracity of the show? Posted in Lobbying News | Comments Off on House of Cards: Fact or Fiction? Are lobbyists unethical? Email 100 words or less to glyons@columbiabooks.com. The best response will be posted. It may be the case that many lobbyists are unethical, but to no greater extent than many school teachers or doctors are. These last are part of noble professions that contain some ignoble people. If lobbyists were incorrigibly unethical, there would have to be something incorrigibly unethical about lobbying. But if the object of the question is the business of lobbying, and not the lobbyists themselves (if it is best read “is lobbying unethical?”), then all logic errs on the side of the negative. The activity of lobbying is ethically neutral: it can go in the direction of big tobacco or bone cancer research. Assessed through the lens of the Constitution, lobbying attains a positive ethical charge. The common thread that unites all lobbyists is their exercise of the freedom of speech and to petition, both couched in the First Amendment. To Lessig, lobbyists are not only not unethical, they’re admirable. Paradoxically, they’re the model of what most people think they corrupt. Posted in Lobbying News | Comments Off on Are Lobbyists Unethical?